Hi Peter, great to see you on here! I am sure that the more we show we are worried about something, the more our children will do it, just to see the effect. You hvae kind of achieved the perfect result: fewer worries, no nagging in the house and more English. Cheers! Greetings from Canada! We’re a bilingual Mandarin/English family and we’ve gone with the same approach you have with our son– I only speak English with him, but we ‘play’ with Chinese together sometimes; my wife only speaks Chinese to him (and a mix with me). Reading your post, a flood of memories/concerns and thoughts of ‘oh-yeah-I-had-hoped-for-that-too’ came back to me. My son is eight now and I feel like we’re *just* now starting to feel like it’s been a successful (albeit painfully slow) campaign. I feel like we’re having more success with our son than some Chinese immigrant families who have started to speak English at home with their children— in watching other families, it seems like there are a few variations on successful strategies; however, the one key key constant is having at least one parent who sticks to the language– everything else seems to essentially be variations on tactics that take into account children’s personality/interests. I agree that avoiding the idea of ‘forcing’ a child into a language is the way to go. Good luck! Hi Ray, thanks for your comment and I am glad you are starting to see results. You are right that every family dynamic will be slightly different, but the sccessful ones are based on a similar template. Looking at some of friends here in Curitiba who also have bilingual families, some achieve success almost immediately and others take much longer. I don’t know if there is any secret ingredient, except perseverance. 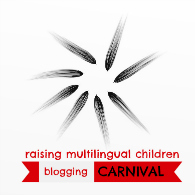 Hello, first of all thanks for this blog, as a parent of 3 bilingual English-Spanish kids (including twins) it’s always fascinating to read about other bilingual children’s experiences. Regarding the effectiveness of recasting in SLA, Lyster & Ranta (1991) found it to be very ineffective, but that was with monolingual FL learners. Hi Tom, thanks for your comment. From personal experience, as well as the reading I have done, I am pretty much convinced that recasting in a second language context is ineffective. I am sure that my students are concentrationg much more on what they are trying to communicate than on what I have just covertly corrected. However, when it takes place across two languages, I have more hope as my son often interacts with what I say and so I think he is paying attention, at least on some level.